Broccoli Salad is a delicious & affordable side dish for parties, picnics and barbecues. Takes only a few minutes to put together, holds up well even if you make the night before and is delicious! Whenever I go to a barbecue potluck or anything where I should bring a side dish, this is one of my “Go To” staples. 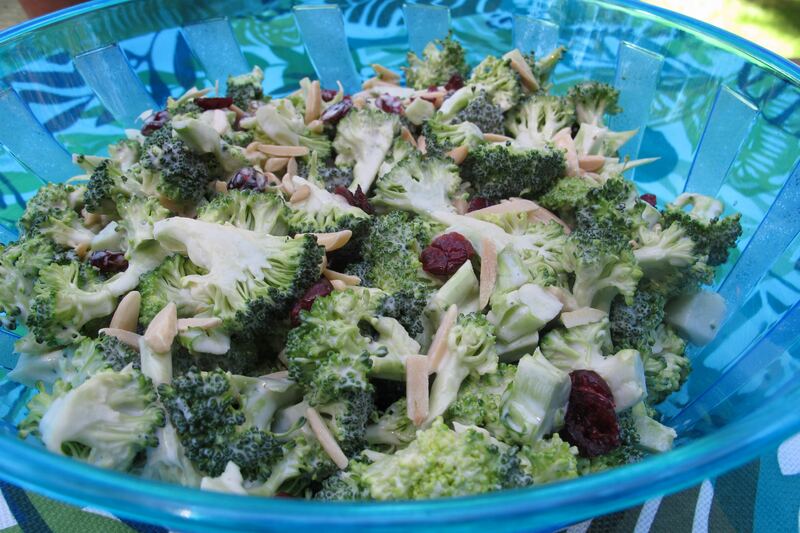 Broccoli salad is also great for a side dish when you are throwing a huge party yourself as it is something that can be made the night before, and quite honestly it tastes better if you do make it the night before as the flavors meld together a bit better. It’s one less thing you have to deal with the day of the actual party. 8 cups of chopped broccoli florets (measure after you chop them into the bite size you prefer). 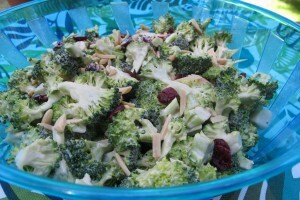 Rinse Broccoli and make sure to dry entirely (a salad spinner works good for this) or else your dressing can get soupy. Chop into desired size for eating. We prefer larger florets than very tiny pieces as the florets hold together better that way. Whisk mayonnaise, red wine vinegar and sugar until smooth and combined. Combine with Broccoli florets. Add Raisins and Cranberries. If you are making this the night before, hold off on combining the nuts until right before you serve. When you are a few hours from serving go ahead and combine the nuts. 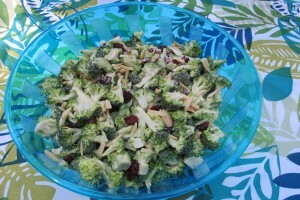 You will want to toss Broccoli salad with tongs right before serving as dressing tends to settle at the bottom. PALEO RECIPE MODIFICATIONS: If you are on the Paleo diet as well or bringing a side dish to a party full of people who eat Paleo, this is a great recipe as the only modification you need to make is to use Paleo Mayonnaise and Coconut crystals instead of light Mayonnaise and sugar for the dressing.